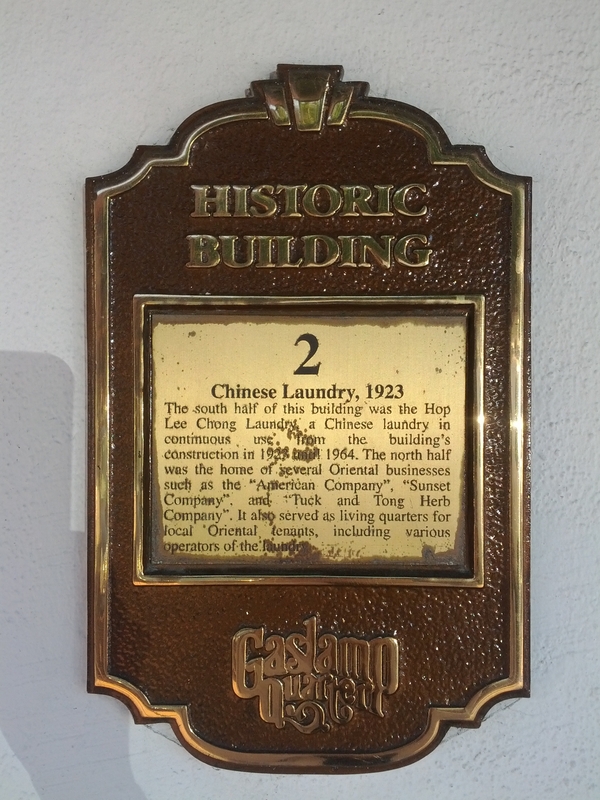 I was excited, and also a bit envious, to discover that San Diego placed a marker on a building in the historic Gaslamp Quarter which housed the Hop Lee Chong Laundry, which was in continuous operation from the building’s construction in 1923 until 1964. 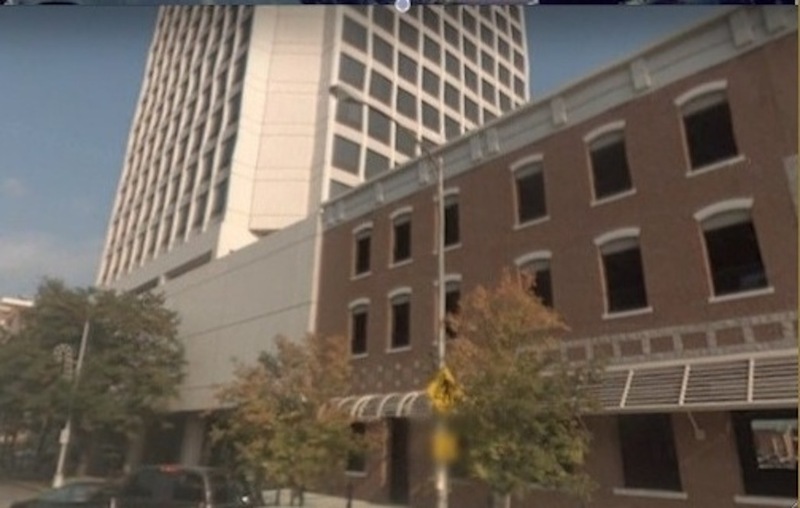 In contrast, I grew up in the Sam Lee Laundry in Macon, Georgia, which started back in 1885 and operated in the same building, (on the right edge of the photo below), until 1956 when my father sold the laundry, retired, and moved to San Francisco . 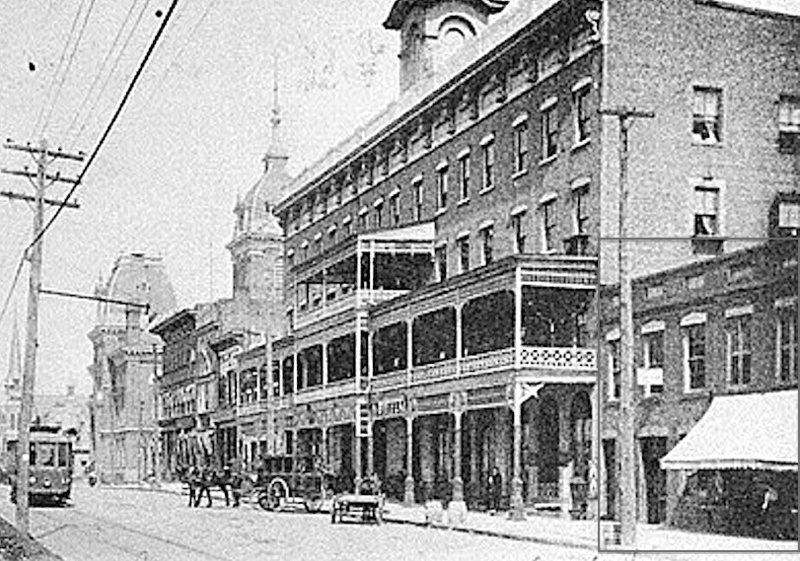 Sometime, probably in the 1970s, the historic building was demolished and converted into a parking lot, which stunned me when I saw it on a visit in 2004. I saw no historic marker at the site! 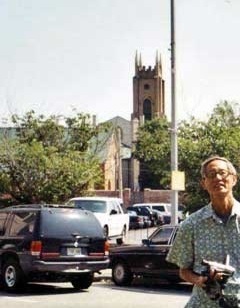 I am standing in 2004 in front of what had been Sam Lee Laundry from 1885-1956. A few years later, the street level open air parking lot was “upgraded” to an enclosed parking structure, but there was still no historic marker! Maybe sometime in the future? The Last Sam Lee Laundry? Today, there are very few Chinese laundries left, Sam Lee or otherwise named, for many reasons. 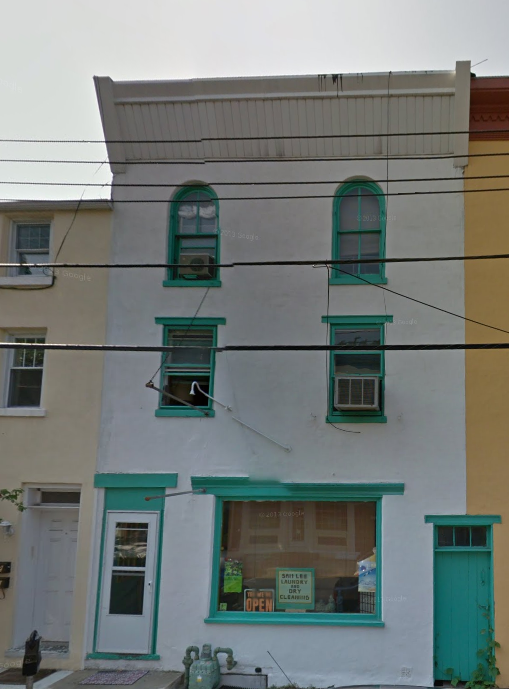 Recently I discovered via the web that a Sam Lee Laundry was still in business in Lambertville, a small New Jersey town near Philadelphia. The 1910 census records show that a laundry at 12 Church Street was run by a Chinese “named” Sam Lee, although as noted above, that may not have been his actual name. In the old photograph below of Church Street from I guess around the 1950s, you can’t see the laundry, looking toward the historic Presbyterian church at the end of the street, but the second photograph shows the laundry as it currently stands at 21 Church Street on the opposite side of its earlier location at No. 12. 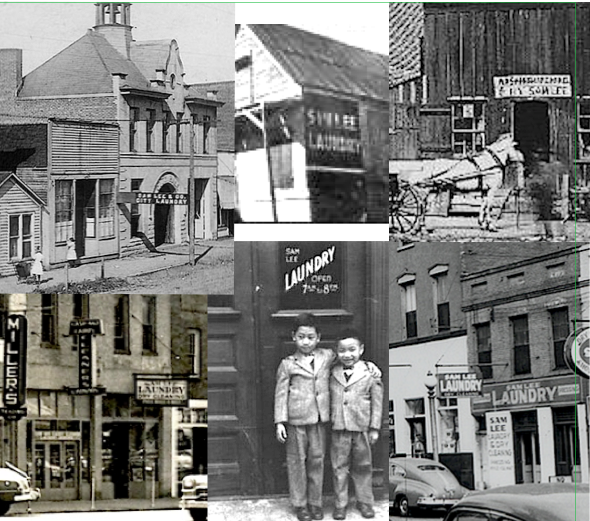 Eventually, immigrants from China, Mon Wai Louie and his wife, Chun Nui, became its owners around 1950 and retained its name as Sam Lee Laundry. 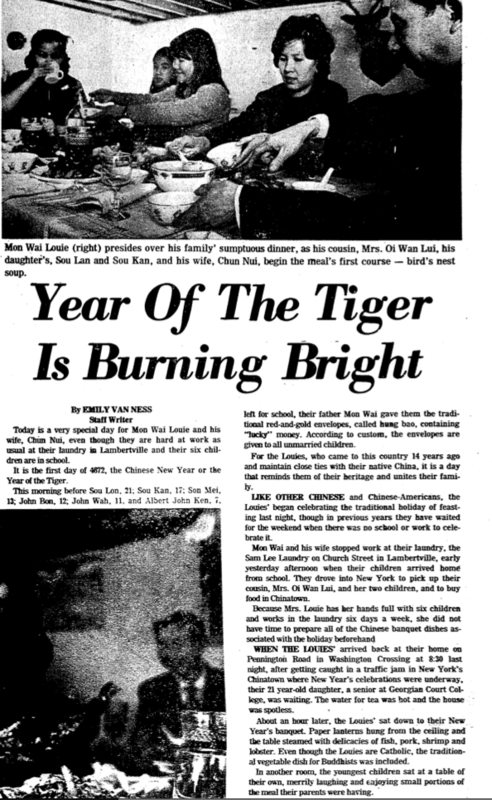 A Trenton, New Jersey, newspaper article featured the Louie family in a 1974 story about how their family celebrates Chinese New Year. That was 40 years ago. Mon Wai Louie and his wife certainly would have retired by now. 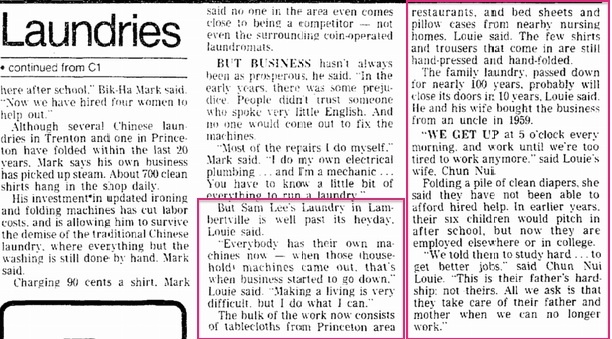 I was amazed it was still in business as Chinese laundries faced a serious threat from the widespread availability of home washing equipment, as noted in a 1987 newspaper article in which Mon Wai Louie was interviewed about the future of Chinese laundry businesses. Somehow, the Sam Lee Laundry in Lambertville managed to stay in business. But I wondered if it was still run by Chinese. Perhaps a non-Chinese had acquired the laundry and simply retained its original Chinese name. My curiosity led me to phone the laundry to find out. I discovered that Chinese still ran the Sam Lee Laundry. John Louie, one of the six Louie children, was its fourth generation owner and continuing the family laundry business, which had been operating for over a century! I don’t know if there are any other Sam Lee Laundries operating today, but this one is, and it could well be the very last one in existence. An examination of the history of one Sam Lee Laundry located for many decades in the heart of Goldsboro, North Carolina, illustrates some reasons why the name was so prevalent even though misleading with respect to the names of the owners. This Sam Lee Laundry was operated by a Chinese known in this town as Sam Lee. 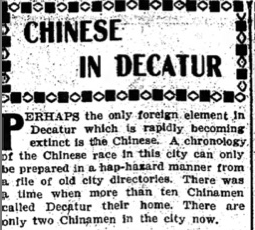 Born in Canton, China, sometime in the 1870s, he immigrated to the U. S. hoping to earn more here than he could in China. Like many Chinese immigrants during this era, he first worked in elsewhere, two years in New York, before coming to Goldsboro and settled down with his laundry for around 60 years, according to him. However, there is no record of the exact year he came to Goldsboro but he did stay there until he closed his laundry in 1960. In Chinese, “Sam Lee” is not a person’s name but a concept that translates to mean “three (triple) profits,” 三利, a name that might be chosen for a laundry business in hopes that the name would magically bestow good fortune. However, many people assumed that a Chinese operating a “Sam Lee Laundry” must be someone named Sam Lee. For such reasons, it is conceivable that his real name was not Sam Lee. The Chinese character for Lee as a surname is 李 , which differs from the Chinese character for profit, 利, even though they have a similar pronunciation. 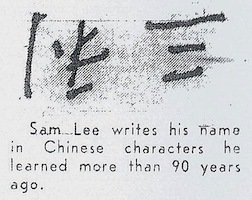 Many years later, when Sam Lee was asked to write his name in Chinese for a newspaper article, he did not use the character for the surname Lee 李 but instead he wrote the characters for triple profits, 三利, although the newspaper, unfamiliar with Chinese, printed his name upside down. 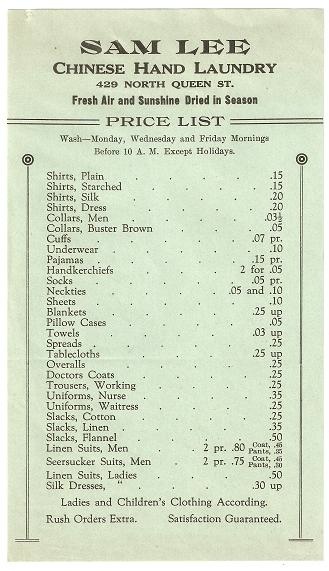 The first City Directory for Goldsboro, published for 1916-17, followed the fashion at that time and used the heading “Chinese Laundries,” to distinguish them from the white-owned steam laundries. It listed two Chinese laundries, one run by Charles Lee at 130 south Center East and another one run by Sam Lee at 137 south Center West. The street number differed by a single digit from the location, 138, given for Sam Lee Laundry in the 1911-12 Directory, so it is reasonable to assume it might actually be the same laundry. According to the 1930 Census, Sam Lee had a Chinese roomer, Lee Joe, age 37. The Census enumerator probably reversed his name, because as noted previously, in 1910, a 17-year old cousin, Joseph Lee, was listed with Sing Lee at his laundry. Lee Joe and Joseph Lee were probably the same person. This evidence fits the conjecture that Sing Lee and Sam Lee might have been the same person since it is highly unlikely that two different Chinese laundrymen of about the same age would each have a roomer named Lee Joe (Joseph Lee). Interestingly, Joe Lee or Lee Joe, worked for a different laundry in between his time in 1910 with Sing Lee and in 1930 with Sam Lee for in the 1920 Census he was listed as a 28-year old servant for a laundryman, Kai Hong, at 127 James St. His moves may have reflected the ups and downs of the laundry business for by 1930 Sam Lee Laundry moved to 205 N. Center St. which was also its address in the 1940 census. Almost 20 years later, on June 1, 1969, the Goldsboro News-Argus newspaper published a heart-wrenching story about Sam Lee (then 89 years old, but described incorrectly as 98 years old). He had operated his laundry for over 50 years until he closed it in 1960, unable to compete against large steam laundries. Without work, he struggled to survive on social security and welfare, unable to even afford glasses or a hearing aid for his declining vision and hearing. Fortunately, a former laundry employee of about 46 years provided him with housing by taking him into her home. The story involved a little white girl who received a pair of small chopsticks from her father serving in the American Air Force in Vietnam who had sought Sam Lee to teach her how to use them. Sam Lee made a gift to her of a larger pair of chopsticks, ones he had brought with him when he first came from China. As news of this kind gesture spread, people in the community reached out to provide Sam Lee with glasses, a hearing aid, food, and even money. Sam Lee’s life was similar in many respects to that of hundreds of other Chinese laundrymen, especially those who lived and worked in isolation from other Chinese, often separated from their wives, children, parents, and other family. The more fortunate ones may have had brothers, cousins, and even sons who managed to circumvent the immigration barriers to join them in operating their laundries. Sam Lee died in Goldsboro in 1978. Death records for North Carolina reported Sam Lee as born in 1877 and dying in Goldsboro at age 100 in 1978, although a local newspaper obituary reported his age as 107. “North Carolina, Deaths, 1931-1994,” index, FamilySearch (https://familysearch.org/pal:/MM9.1.1/FGRS-WJY : accessed 08 Apr 2013), Sam Lee, 23 Mar 1978. The Index of North Carolina Deaths, 1931-1994, indicated he is buried in Willow Dale Cemetery, Goldsboro, N. C., but a check of that Cemetery’s records does not confirm this claim. In my book, Chinese Laundries: Tickets to Survival on Gold Mountain, I speculated about the origins of Chinese laundry names. I noted that while some laundries bore the name of the owner, many laundries had names such as Sing Lee or Sam Lee that were often mistakenly assumed to be the names of the owners. One of the most common Chinese surnames,李, is Lee in English. Sing Lee and Sam Lee being two of the most common Chinese male names in the U. S. from around 1900 to 1920. Most men named Sing Lee and Sam Lee ran laundries. 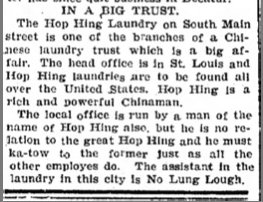 In a sample of 50 Chinese named Sing Lee and 50, Sam Lee, in the 1910 census, 73 percent were listed as laundry heads. 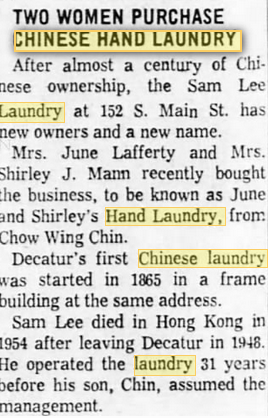 Many Chinese did not speak English well so census takers may have sometimes inferred their names from examining their laundry names, thus inflating the number of laundrymen named Sing Lee and Sam Lee. In Chinese, the ideograph for the common Chinese surname, Lee, sounds like “li,”the Chinese character 利 that means ‘profit.’ Thus, a laundry might be named Sing Lee because “Sing” which refers to “victory,” when combined with “Lee,” translates to “victorious profit.” The Chinese ideograph, 三, for the number three is pronounced “Sam” and when combined with “Lee” 利 connotes making a three-fold or triple profit. Thus, the owner of a “Sam Lee Laundry” is not necessarily someone named “Sam Lee,” but customers might readily make the assumption that it was. Thus, many laundries used names that represented a form of wishful or magical thinking, a belief that its name might contribute to financial success. For example, my father owned a Sam Lee Laundry and even though his Chinese name was Lau Kwok Fui and he adopted Frank Jung as his American name, he was commonly known as “Sam Lee” by townspeople, an error that he felt no need to correct. A similar disparity probably exists for many Chinese laundries, but proof would have to come from interviews with owners as it can not be confirmed from official records. Thus, examination of City Directories can help identify the names and addresses of Chinese laundries, but the name of the owner is not specified. In contrast, U. S. Census records can help identify the names of Chinese who ran laundries but they do not specify the names of their laundries, only their addresses. And, to make matters more difficult, sometimes Chineses names are misspelled, misheard, or illegibly recorded. Census data is sometimes incomplete because the enumerators could not locate some Chinese residents who may have been absent or in hiding, fearing deportation if they lacked proper papers. Discrepancies between owner names and names of their laundries might also occur when there is a new owner. The existing name of an established business might be retained instead of using the new owner’s name for continuity, and to save the expense of a new sign.